Greece, also known as Hellas and officially the Hellenic Republic, is a country in southeastern Europe, forming the southern tip of the Balkan Peninsula and is made up of a series of mountains that run into the sea, extending into scattered islands through the Aegean Sea in the east. 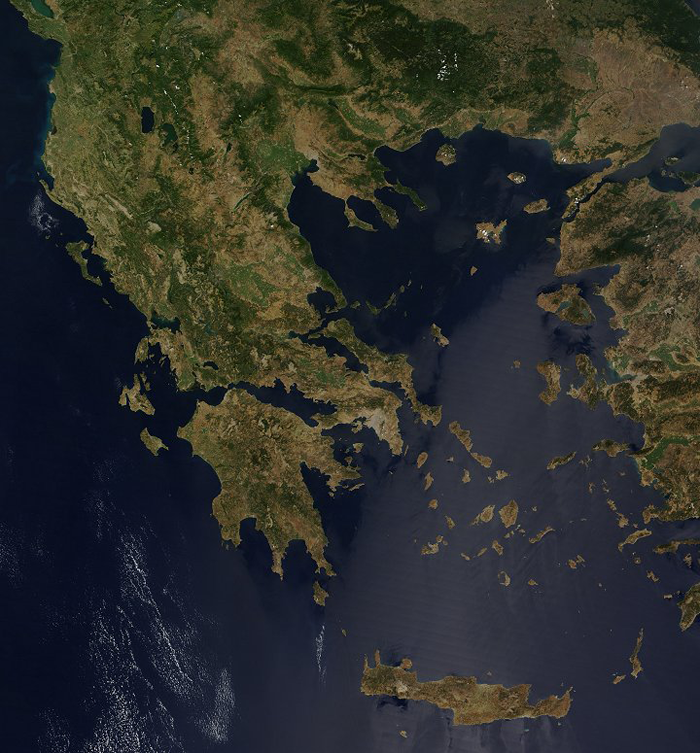 Greece has the tenth longest coastline in the world at 14.880 km in length, featuring a vast number of islands (approximately 1.400, of which 227 are inhabited). Eighty percent of Greece consists of mountains, of which Mount Olympus is the highest at 2.917 m.
Modern-day Greece is a nation of many islands, but in ancient times, Greece was a loose confederation of city-states that usually only came together as a whole to defend themselves from invaders. With easy access to the Mediterranean Sea to the south and the Aegean Sea to the north and northeast, Athens was among the most powerful of the city states. More recently, Athens has again become the center of the world's attention as the Olympic Games returned to their modern birthplace in August 2004. The ancient Games began in 776 BC in the city of Olympia on the northwest side of Peloponnesus. About 2.700 years later, in 1896, the Olympics were reborn in Athens. The 2004 Olympics mark the 28th modern Olympiad. Greece was the first area in Europe where advanced early civilizations emerged, beginning with the Cycladic civilization of the Aegean Sea, the Minoan civilization in Crete and then the Mycenaean civilization on the mainland. Later, city-states emerged across the Greek peninsula and spread to the shores of the Black Sea, South Italy and Asia Minor, reaching great levels of prosperity that resulted in an unprecedented cultural boom, that of classical Greece, expressed in architecture, drama, science and philosophy and nurtured in Athens under a democratic environment. Modern Greece traces its roots to the civilization of ancient Greece, generally considered to be the cradle of Western civilization. As such, it is the birthplace of democracy, Western philosophy, the Olympic Games, Western literature and historiography, political science, major scientific and mathematical principles and Western drama, including both tragedy and comedy. 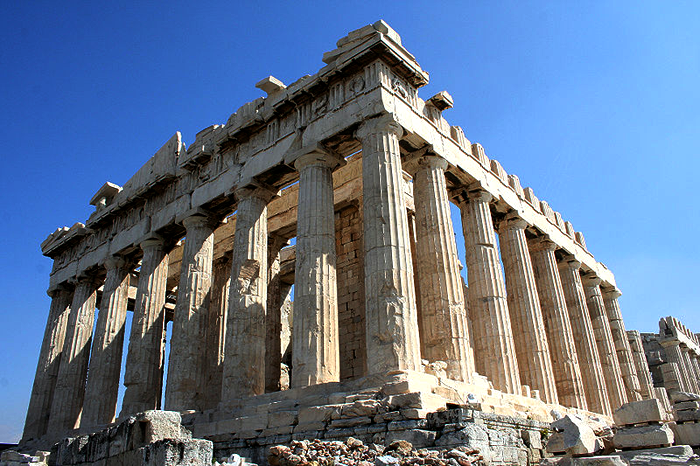 This legacy is partly reflected in the 17 UNESCO World Heritage Sites located in Greece. A developed country with a very high Human Development Index and standard of living, Greece has been a member of what is now the European Union since 1981 and its Economic and Monetary Union since 2001, NATO since 1952, and the European Space Agency since 2005. It is also a founding member of the United Nations, the OECD, and the Black Sea Economic Cooperation Organization. Athens is the capital. Other major cities include Thessaloniki, Piraeus, Patras, Heraklion and Larissa. The texture of mountain and valley, makes Greece appear marbled in tan and green in this true-color image, captured by the Moderate Resolution Imaging Spectroradiometer (MODIS) on NASA's Terra satellite on August 19, 2004. The bright green areas in the center and right side of Greece are agricultural areas. This green is lighter in tone than the native dark vegetation that grows in ragged lines along the mountain ranges. The grey and tan pock marks within the agricultural areas are small cities. Greece's largest city and capital, Athens, forms a large grey pock on the southern tip of the mainland. The mountain range from the mainland, continues through the central Peloponnese, crosses the islands of Kythera and Antikythera and find its way into southwestern Aegean, in the island of Crete where it eventually ends. The islands of the Aegean are peaks of underwater mountains that once constituted an extension of the mainland. Pindus is characterized by its high, steep peaks, often dissected by numerous canyons and a variety of other karstic landscapes (The karstic landscapes are particular areas of the Earth with a unique topography, usually rough and wild, dominated by rock and shortage of water and soil). Most notably, the impressive Meteora formation consisting of high, steep boulders provides a breathtaking experience for the hundreds of thousands of tourists who visit the area each year. Northeastern Greece features another high-altitude mountain range, the Rhodope range, spreading across the periphery of East Macedonia and Thrace. Ôhis area is covered with vast, thick, ancient forests. The famous Dadia forest is in the prefecture of Evros, in the far northeast of the country. Greece on the Globe, a small work of art! Expansive plains are primarily located in the prefectures of Thessaly, Central Macedonia and Thrace. They constitute key economic regions as they are among the few arable places in the country. Rare marine species, such as the pinniped seal (Monachus-monachus) and the loggerhead sea turtle (Caretta-caretta), live in the seas surrounding mainland Greece, while its dense forests are home to the endangered brown bear, the roe deer (Capreolus capreolus), the wild goat and maybe the lynx. Phytogeographically, Greece belongs to the Boreal Kingdom and is shared between the east Mediterranean province of the Mediterranean Region and the Illyrian province of the Circumboreal Region. According to the World Wide Fund for Nature (WWF) and the European Environment Agency (EEA), Greece can be subdivided into six ecoregions: the Illyrian deciduous forests, Pindus Mountains mixed forests, Balkan mixed forests, Rodope montane mixed forests, Aegean and western Turkey sclerophyllous and mixed forests and Crete Mediterranean forests. Deadly wildfires in southern Greece and wafted thick clouds of smoke over the Mediterranean Sea in late August 2007. According to news reports from the British Broadcasting Corporation (BBC), at least 60 people had been killed by these fires. Hundreds of homes had been burned and thousands of people had to evacuate, many by helicopter. The government suspects that the fires were caused by arson, and it has declared a national emergency to deal with the situation. Firefighters from more than 20 countries had arrived to help control the fires. The fires on Peloponnese at August 2007, were one of the biggest disaster that the country experience. 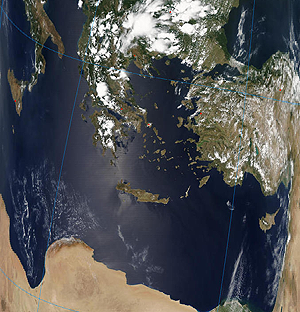 The climate in Greece is predominantly Mediterranean. However, due to the country's unique geography, Greece has a remarkable range of micro-climates and local variations. To the west of the Pindus mountain range, the climate is generally wetter and has some maritime features. The east of the Pindus mountain range is generally drier and windier in summer. The climate can be categorised into three types (the Mediterranean, the Alpine and the Temperate) that influence well-defined regions of its territory. The Pindus mountain range strongly affects the climate of the country by making the western side of it (areas prone to the south-westerlies) wetter on average than the areas lying to the east of it (lee side of the mountains). The Mediterranean type of climate features mild, wet winters and hot, dry summers. The Cyclades, the Dodecanese, Crete, the Eastern Peloponnese and parts of the Sterea Ellada (Central Continental Greece) region are mostly affected by this particular type of climate. Temperatures rarely reach extreme values along the coasts, although, with Greece being a highly mountainous country, snowfalls occur frequently in winter. It sometimes snows even in the Cyclades or the Dodecanese. The Alpine type is dominant mainly in the mountainous areas of Northwestern Greece (parts of Epirus, Central Greece, Thessaly, Western Macedonia) as well as in the central parts of Peloponnese, including parts of the prefectures of Achaia, Arcadia and Laconia, where extensions of the Pindus mountain range pass by. Finally, the Temperate type affects Central Macedonia and East Macedonia and Thrace. It features cold, damp winters and hot, dry summers with frequent thunderstorms. Athens is located in a transitional area featuring both the Mediterranean and the Temperate types. The city's northern suburbs are dominated by the temperate type while the downtown area and the southern suburbs enjoy a typical Mediterranean type.